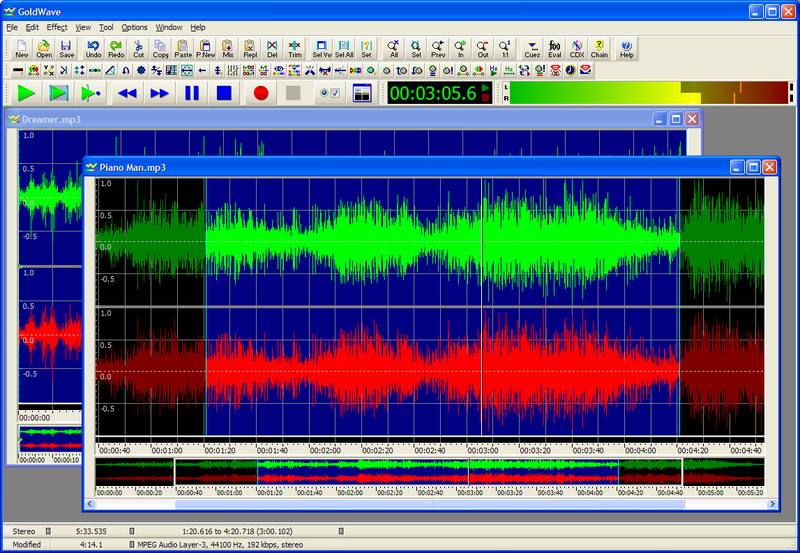 GoldWave is a top rated, professional digital audio editor. Themese and other interface changes have been made to improve usability. New unified help file in standard HTML format. Posted by Lou on Wed, 04/10/2013 - 04:36. I just went from my very old amd64 machine to an athlon II X4 465 quad core cpu and motherboard and pc1066 ram. The drives are the same, so is the sound card which is old -- soundblaster live 5.1, and interestingly enough I didn't have to reinstall the os (windows xp pro sp3), just the drivers so not sure if that's a real issue yet or not. Anyhow, I have GW v.5.58 and it's been fine for quite some time now but now that I am recording again I have noticed some clicks that happen in every recording so far. About 10-15 seconds into it on the playback I hear some repetitive clicking sounds that last for about 5 seconds. That wasn't happening before I changed out the hardware so I'm thinking it might have something to do with it. Anybody have this problem and is there anything I need to do to straighten it out? Thanks. Posted by Kim on Fri, 11/06/2009 - 19:48. Does anyone know why Goldwave locks up as soon as I hit the play or record button? It works again if I restart the computer. Running Vista 64 bit. Posted by Jim Anderton on Fri, 01/05/2007 - 19:11. My Dell plays most things very well, but when I record my old vinyls via a soundcard and Goldwave there is no obvious (to me) way to listen to the music I am recording. I'd be grateful for advice. Posted by Anonymous on Thu, 06/04/2009 - 12:24. This is a piece of crap,it can't find any files in the folders. Crap,if this s**t don't function what f**k do we want with it? Posted by Yaktchu Regloh on Sat, 01/20/2007 - 23:38. Firstly you should set the file type of record - .ogg is really good, remember to set the freq. to 96k, also set the enchantment of the microphone to about 35%, next after recording its the worst thing to do - cutting tracks and mastering. If your pc is connected with hi-fi it's better to take off any DBB and so on.It's obvious to set off any sound enhacments that are probably set on on your sound card or programs for it. If all goes ok, you'll be listening your favourite tracks from cd. Posted by STEVE FARLEY on Tue, 08/22/2006 - 22:26. I am using GoldWave to record vinyl LP's onto my computer hard drive. Can anyone please tell me how i set the programme to seperate the tracks automaticly as the album plays through so that i can save them as seperate files to burn to a CD. Many Thanks. Using Gold Wave to separate tracks from an LP. Posted by Nflder on Tue, 10/21/2008 - 02:02. I have been using GoldWave for several years and am completely satisfied with it. For a tiny program it is absolutely phenomenal. It has a Cue function which has an auto cue. once you have the CD recorded into GoldWave you can use it to find the quiet passages between cuts automatically and set a cue point there. You can name the cue point to be the name of the next cut. When you are finished setting all the cues you "split" the file and the cuts are all saved to the folder of your choosing split apart at the cue marks and you can choose to save these files using the name of the cue mark. There are a number of different choices you can make all along the process. You can even choose the file type to save the new files in. Once set the cue marks are quite visable and if a cue needs to be moved you can click and drag it. AND it's easy to use. Hope this helps. You should get it and try it. It also has exceptional filtering processes to get rid of pops & noises of a wide varity. Posted by Jim on Tue, 02/13/2007 - 13:02. I just downloaded this version and noticed your query. After using an older version for compiling vinyl file for my ipod, I found no such macro algorythmn for doing the work. Wouldn't life be nice if it would? The conversion from old vinyl to the digital realm is tedious at best, kind of like doing your laundry, best if done in small batches between other tasks. Also not carried in on mp3 track files you'll generate by copy and paste is data such as song title, album, genre, etc. The program doesn't automatically eliminate clicks, and pops either. But as a manual method for achieving an end, Goldwave is the software I run to for my editing needs. To beat the tedium, I'll occasionally forgo the resolution of the album into tracks and just have the whole side of the album to play at once, kind of a homage to the way these were originally spun. The other thing I've noticed is that sometimes the album information is not accurate, either by design or by accident. I have a lot of cut-outs and perhaps these were the accidents. Things like song duration and title are sometimes transposed on a few of the album tracks, perhaps in an attempt to combat piracy. If there were a way to separate tracks, it would probably involve running the mp3 file through a time filter log and looking for the dropouts of the sound profile and copy and pasting and saving accordingly, but might be confused depending on the actual music by dwells of no sound. Sounds like something outside the scope of GW. : I am using GoldWave to record vinyl LP's onto my computer hard drive. Can anyone please tell me how i set the programme to seperate the tracks automaticly as the album plays through so that i can save them as seperate files to burn to a CD. Many Thanks. Posted by shoaib ahmed on Sat, 12/03/2005 - 14:44. I have a laptop but have no proper facility.Ihave free space of about 5.4gb.Will it have any problem in running other programmes. Posted by Smith, R on Tue, 12/13/2005 - 22:39. I have installed GW on a laptop with no problems,loaded useing 4.12 version and it worked fine, I had a 40gb on the system, and have about 24 free, ran well, but slower than if I would have had a larger hard drive and more memory. This program has it's minimum's, and they can be encroached on but will leave you wishing you had the right stuff to run it correctly. I use GW on desktops as well. Of course the newer desktops run it better, because of the space, and memoray available. It is by far the best editior that I have found, and it is getting even better each time I look at it and find something else I can do. Posted by dagaul on Sun, 08/07/2005 - 11:52. I am looking for some help with my sound recorder, I use a headset with a mic attached, I have tried it with another device and I know the mic and headset work just fine, however my sound recorder does not work on my win98, the headset works for the headphones but for some strange reason I am unable to use windows sound recorder to record any sound, or any sound that requires recording via a mic, I have run out of ideas, at first I thought it was because I had halted installation of Microsoft office's text to speech that comes with Microsoft word half way through the installation, or that I had installed total recorder, but after uninstalling all these programs I am still unable to use sound recorder, even uninstalling and reinstalling multi-media windows components in the control panel made no difference, the mic is not muted in sound properties, the line in is muted for playback, and the mic is the only selection for recording, loop works fine, so I am wondering exactly what the problem could be, any help would be greatly appreciated thanks. Posted by Reginaldo on Mon, 03/07/2005 - 11:32. Does anyone know a software that allows to create a Drums sound of Music ??? And after, I would like to join with my guitar sounds... to create my owner CD !! Posted by DEVENDRA on Fri, 11/03/2006 - 13:49. Posted by John on Mon, 03/07/2005 - 02:08. On XP version 5.1 with. Reading and Writing mp3 files is incredibly slow. Do I have something set wrong? The same is true for writing mp3's. Posted by inas on Tue, 02/15/2005 - 20:33. Posted by pierre on Tue, 01/25/2005 - 10:20.
quelqu'un aurait-il la traduction du manuel Goldwave en francais, car l'anglais n'est pas mon fort!!!! Posted by pobel pierre on Tue, 01/25/2005 - 10:21.
: quelqu'un aurait-il la traduction du manuel Goldwave en francais, car l'anglais n'est pas mon fort!!!! Posted by d;mf; on Wed, 11/23/2005 - 14:59.
: : quelqu'un aurait-il la traduction du manuel Goldwave en francais, car l'anglais n'est pas mon fort!!!! Posted by Néstor on Mon, 01/24/2005 - 13:11. I use efect reduce Vocals and I don´t hear vocals in all songs, I check my speaker connections and this its good, I restar my system and the problems continues. ¿How do i remove effect once it is applied to the Sound? ¿Why it affect all songs? Posted by tony on Thu, 12/30/2004 - 20:56.
i am getting an error message-"gwave506 has caused an error in<unknown>" , followed by another message-"this operation has been cancelled on this computer.Please contact your system administrator"
Posted by richie on Tue, 12/07/2004 - 23:15.
thats so simple yet brilliant! Were there ever real witches? Posted by Java Anonymous Proxy X on Thu, 11/18/2004 - 15:32. Posted by Tom Ward on Fri, 11/12/2004 - 17:32.
: You guys seem to know a lot about this. I have a question for you. My sound recorder won't work, and I have no idea what to do with it. At first I thought it was my microphone, so I bought another on, but it wasn't it. i have no idea what's wrong with it. HELP!!! Posted by kat (via moderator) on Tue, 07/20/2004 - 05:27. I recently downloaded Goldwave and the LAME file. I saved LAME to Goldwave. When I try to save from a line-in minidisc player to mp3, I get the following error message "No codec is available to encode or decode the audio format". The file is there but I downloaded LAME again and this time put it in the windows/system file but I am getting the same message. Can anyone help me? Posted by Shing (via moderator) on Tue, 11/02/2004 - 01:54. Posted by LMT on Sun, 07/18/2004 - 00:06. I am feeding my vinyl into my mic port on my laptop (no 'Line In/Out' option), and my 'Headphones' as my line out to my stereo. I can record wonderfully, and play back wonderfully, but I can not hear what I am recording at the same time as I am recording. In other words, while it is recording, all is silent, recording, but silent. When I have completed my recording, I can then play it back, and all is well. Posted by Timmy on Thu, 04/22/2004 - 09:53. I'm looking for PC software that supports the use of a footswitch (Olympus) to stop, start, FF, Rewind. Posted by victor on Tue, 04/13/2004 - 18:02.
: : a recording studio can? Posted by Clay on Thu, 02/12/2004 - 15:08. I can't figure out how to save a loop file or even record a sound on Goldwave. The help topics isn't helping. Also, I need to insert a sound between 2 sounds. Can anyone help? All the names of the tabs are confusing because there are no pictures in the help section. Posted by alex maccioni on Thu, 01/22/2004 - 19:42. Anyone out there know how the hell I can mix or blend two tracks together, never used this type of thing before and getting frustrated! Posted by Randiest on Wed, 12/03/2003 - 17:39.
is it possible to edit out specific words on re-recorded audio from cassettes to be put on CD? Posted by Matt on Mon, 08/18/2003 - 20:47.
when i try saving something i have edited an error mesage pops up saying no codec is available to encode or decode the audio format. PLEASE HELP!! Posted by mdma on Sun, 05/04/2003 - 15:14. Posted by willie on Wed, 04/02/2003 - 15:15. Posted by Paul on Tue, 01/21/2003 - 19:11. Does anyone have any goldwave tips? I have a couple. Email me and I'll send them to you. Posted by yong haeng lee on Tue, 06/17/2003 - 23:32.
: Does anyone have any goldwave tips? : I have a couple. Email me and I'll send them to you. CD'S BURNED FROM GOLDWAVE FILES SKIP !!!! Posted by DJ LIEN on Sat, 01/18/2003 - 01:50. I have been recording dj mixes to mini disc, hen recording and editing in goldwave. Everything works perfecly, I can track out mixes and burn them. The only problem is CD's I burn from Goldwave files all start to have small skips in then from about 30 minutes to the end of the recording. Does anybody know what would cause this?My computer is 266 MHZ celeron with 224 MB of ram. I am running a sony 48x24x48 burner. Please help!!!!! Re: CD'S BURNED FROM GOLDWAVE FILES SKIP !!!! Posted by cardeline on Wed, 01/21/2004 - 09:44.
: I have been recording dj mixes to mini disc, hen recording and editing in goldwave. Everything works perfecly, I can track out mixes and burn them. The only problem is CD's I burn from Goldwave files all start to have small skips in then from about 30 minutes to the end of the recording. Does anybody know what would cause this?My computer is 266 MHZ celeron with 224 MB of ram. I am running a sony 48x24x48 burner. Please help!!!!! Posted by hype on Mon, 12/09/2002 - 23:30.
is it possible to erase the words of a song while leaving the beats with this program? if so how? Posted by manish trivedi on Fri, 12/06/2002 - 17:54. I want to know details about operating the goldwave software and its tutorials. Posted by NIge on Wed, 11/27/2002 - 19:40. Using Goldwave is it possible to seperate the Individual Tracks that make up a complete album so that when you have recorded it you can select the individual tracks? And if so , how do you do it? Posted by chris hunter on Mon, 01/05/2004 - 13:27.
: Using Goldwave is it possible to seperate the Individual Tracks that make up a complete album so that when you have recorded it you can select the individual tracks? : And if so , how do you do it? Posted by Kathy on Fri, 03/12/2004 - 09:24.
: : Using Goldwave is it possible to seperate the Individual Tracks that make up a complete album so that when you have recorded it you can select the individual tracks? : : And if so , how do you do it? Posted by mick on Fri, 11/26/2004 - 07:54.
: : : when downloading an album from winmx how do you split album into seperate tracks as it seems to download as 1 track only. Areply with advice would be great. Posted by mick on Fri, 11/26/2004 - 07:59.
: : : : when downloading an album from winmx how do you split album into seperate tracks as it seems to download as 1 track only. Areply with advice would be great. Posted by mick on Fri, 11/26/2004 - 08:01.
: : : : : when downloading an album from winmx how do you split album into seperate tracks as it seems to download as 1 track only. Areply with advice would be great. Posted by eddie on Sun, 09/26/2004 - 17:44.
: : : Using Goldwave is it possible to seperate the Individual Tracks that make up a complete album so that when you have recorded it you can select the individual tracks? : : : And if so , how do you do it? Posted by J. Panic on Thu, 12/26/2002 - 15:32. Sure, you can split out tracks either during the capture process, or after capturing an entire side. Recently I converted some rare audio cassettes to WAV files to burn using Goldwave. With cassettes, I found it easier to capture an entire side, then check the spectrum analysis, looking for the null (flatlines) to separate tracks. I had one Monty Python cassette with little to no dead air between tracks, so I separated tracks as best as I could. The end result was fantastic, with no null space between tracks. If you wish to do an entire side at a time, you'll need to select the entire track, then cut, then paste as new track. Save the new track by number and you'll be rocking. I found it easiest for the program to handle edits from the end to the front, so cut the final track from a side, then second to last and so on. If you cut and paste from the beginning, Goldwave needs plenty of processor to crunch while pushing up the remaining side. However, with albums, I would likely capture one track at a time, particularly if your CPU is as weak as mine is (Pentium 200mhz). When capturing, simply estimate the length of the track (estimate long, since you can stop recording at any time), then run your source, set your levels to optimum output (just touching red), and you're ready to roll. I would also run a filter on each track once captured to reduce pops that can sometimes crop up on vinyl. For my tapes, I used the hiss reducer, which worked well for me. BTW, make sure to hook up your turntable using the correct input jack on your sound card. If you use the microphone input, you'll find it difficult to reduce your levels below a roar. Posted by paularoid on Sat, 08/09/2003 - 02:51. And one thing you ^must^ do is make sure you do NOT bypass the amp. You CAN NOT just go straight from the turntable to your sound card. You MUST go from the turntable, to the amp, to the soundcard. If you don't, you'll end up with a whole lot of nothin'. A great big wav file full of a lot of nothing. That signal has to have some amplification or you have nothing. : Sure, you can split out tracks either during the capture process, or after capturing an entire side. : Recently I converted some rare audio cassettes to WAV files to burn using Goldwave. With cassettes, I found it easier to capture an entire side, then check the spectrum analysis, looking for the null (flatlines) to separate tracks. I had one Monty Python cassette with little to no dead air between tracks, so I separated tracks as best as I could. The end result was fantastic, with no null space between tracks. : If you wish to do an entire side at a time, you'll need to select the entire track, then cut, then paste as new track. Save the new track by number and you'll be rocking. I found it easiest for the program to handle edits from the end to the front, so cut the final track from a side, then second to last and so on. If you cut and paste from the beginning, Goldwave needs plenty of processor to crunch while pushing up the remaining side. : However, with albums, I would likely capture one track at a time, particularly if your CPU is as weak as mine is (Pentium 200mhz). When capturing, simply estimate the length of the track (estimate long, since you can stop recording at any time), then run your source, set your levels to optimum output (just touching red), and you're ready to roll. : I would also run a filter on each track once captured to reduce pops that can sometimes crop up on vinyl. For my tapes, I used the hiss reducer, which worked well for me. : Hope this helps you out. : BTW, make sure to hook up your turntable using the correct input jack on your sound card. If you use the microphone input, you'll find it difficult to reduce your levels below a roar.